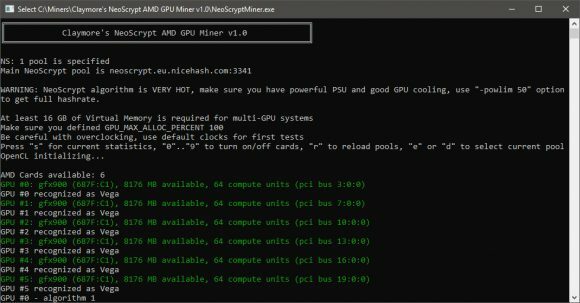 Claymore is extending his coverage on the different mining algorithms with a new NeoScrypt AMD GPU miner that ahs been available for a few days already and we’ve played a bit with it to see what it can deliver. Do note that even Claymore warns that the NeoScrypt algorithm is VERY HOT, so yo uneed to make sure you have powerful PSU and good GPU cooling. Also to get the best hashrate you need to set your GPUs to use “-powlim 50” option in the miner (+50% Power Limiter), though you cans till play with the voltages of the GPUs lowering them to reduce the power usage. 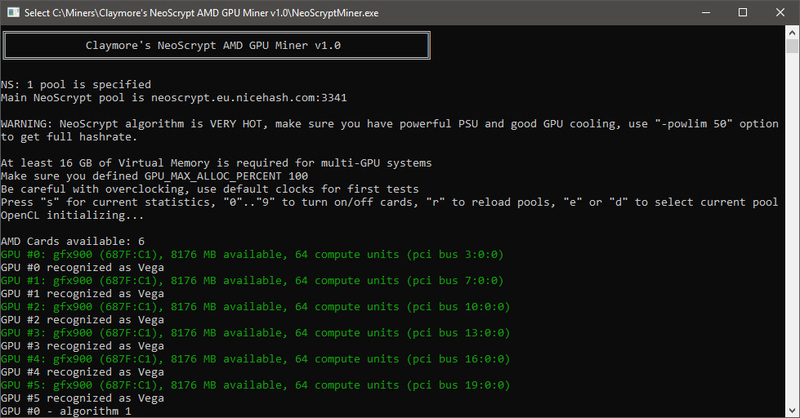 o note that like other miners from Claymore this one comes with a dev fee included, the Claymore NeoScrypt AMD GPU miner has a developer fee of 2%, so every hour the miner mines for 72 seconds for developer. AMD’s RX 4xx/5xx series of GPUs do manage to provde a hashrate of up to about 900 KHS, but the old 280X GPUs are also quite interesting with about 800 KHS as well as 290X/390X at 1100 KHS. Owners of AMD Radeon RX VEGA 56/64 could be the ones with the most benefit as the miner is capable of delivering up to about 2200 KHS and that is a lot. Of course in order to maximize the performance in terms of hashrate you need to unlock the GPU power limiter and increase the clocks and see how low the GPU voltage can go stable. With settings optimized for CryptoNight a VEGA 64 can do just about 1400 KHS (that is with low GPU frequency, high memory and -20% power limit), at stock settings you can get about 1700 KHS from a VEGA 64 and for 2200 KHS you need +50% power limit. So again make sure you can cool down the GPUs properly and that your power supply is powerful enough to handle the extra load. Profitability wise for VEGA GPUs mining NeoScrypt at 2200 KHS per card can be better than optimized settings for CryptoNight for about 2000 H/s.